As a franchisee you would be the business owner and it would be your responsibility to make a success of your business. But you would do so with the ongoing support of the franchisor, not to mention fellow franchisees. And remember, your initial investment doesn't simply disappear. As you grow your business and as we grow the brand, so the value of your business will grow. If you are successful and should you wish to sell one day, your business should be worth more than your initial investment. When did you start franchising your business? If a franchisor has been trying to sell franchises for a few years, but still only has a small handful, you should ask yourself why? How many franchisees do you have and where are they? A franchise system is the sum of all its parts and each and every franchisee adds value to the network, both in terms of brand value and experience. It is not in the interests of the franchisor to sell a franchise to just anyone, simply to boost numbers. However, a franchise network built of carefully chosen, skillfully trained franchisees is a resource that cannot be ignored by a prospective franchisee. Both franchisor and franchisees learn and grow from the experience of their network, which is a huge asset to anyone involved in that particular business. For how long were your pilot franchisees up-and-running before you began to sell franchises? A reputable and ethical franchisor will have run at least two pilot franchises for a year before selling more franchises. What type of support can I expect from Head Office? Ask who works at the Head Office and what role they will play in supporting your franchise. What are my ongoing fees to you? You will be expected to pay a management fee and a national advertising fee. These should be a percentage of your turnover rather than a flat fee regardless of your turnover. Are you a full member of the British Franchise Association? All franchisors should be a member of the BFA. This is the regulatory body for franchising in the UK and a franchisor cannot become a member without being thoroughly checked out and approved by the BFA. Full Members have undergone the most rigorous assessment by the BFA. Do you have a history of successful franchise re-sales? As a prospective franchisee, this is an important question. As with any career, there may come a time when you want to move on. You need to know that having invested in a business and made a success of running that business, you can sell it when the time is right for you. As a franchise network grows, extending its national and international reach, so it develops a brand. It becomes an increasingly attractive business to potential buyers and, correspondingly, the value of the brand strengthens. The brand (and brand value) of a smaller franchise network is commensurately weaker. Tell me about your brand – what does it stand for and what makes it the market leader? While sales are not the only thing that determines a brand or market leader, they are undoubtedly a deciding factor. Customers buy the product and/or franchise they like the best from the company they like the best (not to be confused with the cheapest product or franchise). Here are just some of the factors you should look at which have an impact on the strength of the brand you might invest in, both in terms of its franchise sales and its franchisees’ ability to sell its products. Consistent Quality - Consistent quality should be a top priority for any franchise network, particularly if its products are handmade. What is their approach to quality control? What’s to stop another franchisee producing poor quality products, thereby having a negative effect on your business and its image? National Coverage ­­– A solid network of successful franchisees, rather than just a handful. International Coverage – An international franchise brand will always have more value than a purely national one. Accolades – These include awards and achievements related to the business as a whole, particularly if related to the BFA. You want to have confidence in the company you are about to invest in, so it’s always reassuring to know that that business is highly regarded in the field. Infrastructure ­– A head office team with individuals dedicated to specific areas of support for you (management, admin, marketing and PR, website, training) rather than one person juggling everything. Eye-catching, recognisable logo – an obvious point, but important none-the-less. Eye-catching marketing materials – Well designed flyers, posters and business cards are essential brand marketing collateral. Great website – A good website is vital for showcasing products – it needs to be clear, simple and reflect the brand. Outstanding customer service – Good customer service is not just about receiving a great product. It is about the experience the customer has in making their purchase from their first interaction with a franchisee, through to receiving their items. Excellent franchisees – For a franchise network, it is both the quality and number of their franchisees that make the brand. If a franchisor has only a few franchisees, they don’t have a brand. If they have bad franchisees, it can reflect badly on their brand. If you would like to find out more about franchising, visit the British Franchise Association's website www.thebfa.org. 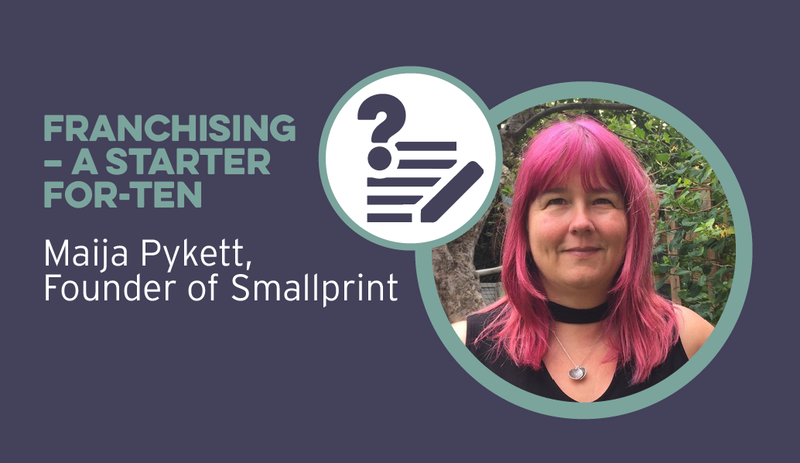 To find out more about the Smallprint franchise, please visit www.thesmallprintfranchise.com.